Here are some savory low glycemic recipes made from foods listed on the low glycemic food list to get you started on a new way of eating! Go to glycemic index to learn why this is the only way to lose fat permanently. Eliminate the high glycemic foods from your kitchen and pantry and dive into these recipes. As you do you will learn how to modify your old recipes by substituting low glycemic foods. The idea is to not raise your blood sugar. Sugar plus fat equals fat storage so when you stop spiking your blood sugar with high glycemic foods you can elminate sugar cravings and extra fat. People who are overweight or obese need to know that high blood sugars lead to fat storage, not the other way around. The best weight loss plans require foods that keep your blood sugar low and even. To be thin AND healthy you need low glycemic foods! Low glycemic recipes call for only low glycemic ingredients. To make this easy it is best to get rid of all the foods you don't need anymore, the high glycemic foods. They contribute to fat storage, trigger food cravings and over eating and are simply not healthy. Throw away your foods with refined, hydrogenated fats that are the unhealthy fats. See the high glycemic foods list for a list of these fats and all high glycemic foods. And keep reading for the recipes below. Now comes the fun part! Stock your pantry with olive oil, raw nuts, seeds, whole grains and legumes. Include canned beans, canned, chopped tomatoes and lots of your favorite spices. Many natural foods stores sell olive oil in bulk and you can take your own jar so it's not expensive. Remember you will be using small amounts for cooking and salad dressings. You can learn to stir fry. Become familiar with the low glycemic food list and get to know your local farmer's market. You want to avoid processed foods that have high glycemic preservatives. Buy fresh and local ingredients from your neighbors and local farmers. Organic produce costs a little more because it's more expensive to grow vegetables and fruits with organic fertilizers and using labor intensive methods. But these organic growing methods are far better for the planet and for your health. Low glycemic foods are actually much cheaper than high glycemic ones when you factor in the costs to your health to eat highly processed, white foods. It's extremely expensive to be overweight and sick. 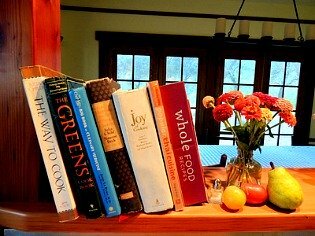 Look for cookbooks and recipes that incorporate the Mediterranean style of cooking and eating. The traditional, Mediterranean way of cooking uses more legumes, whole grains, olive oil, raw nuts and seeds, lots of fresh produce and a little meat. It is rich in high fiber foods and low glycemic. The low glycemic recipes below will get you started. Are you diabetic? These are diabetic recipes because they do NOT raise your blood sugar. Check back often because I will continue to add low glycemic recipes! If you have a question about what to substitute for a particular high glycemic food go to Your Questions so I can give you some ideas. I would highly recommend that you do this until you are in the habit of cooking this way. Return from Low Glycemic Recipes to Lifetime Fat Loss home page.